The telephone is arguably one of the most important inventions of modern times. We have come a long way from the prediction that one day there would be a telephone in every major city in the USA. Learn more about the invention and evolution of the telephone. Brought to you by Best Answering Service. Do you know the history of the phone you’re probably holding in your hand right now? In the age of the cell phone, it’s easy to forget there was a time when our friends, family, and jobs weren’t just a click of a button away. But when the telephone was first invented, it revolutionized the way we communicate. The evolution of the telephone has gone through many different stages before reaching the modern cell phone. In this guide, we’ll go over the entire history from the first telephone onward. Keep reading to learn about the most interesting telephone history! You could say that the telephone has two inventors. Elisha Gray and Alexander Graham Bell both came up with ways to send speech electronically in the 1870s. They designed their prototypes at so near the same time that they took them to the patent office just hours apart from each other. 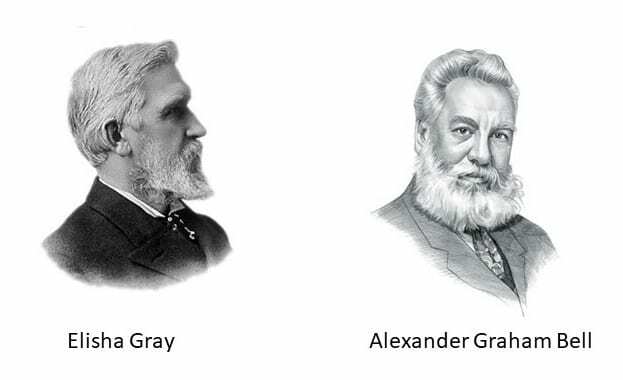 However, if the name Elisha Gray doesn’t sound familiar and Alexander Graham Bell does, there’s a reason for that. Bell won the first patent, and won the ensuing legal disagreement with Gray too. Bell was born in 1847 in Scotland. His family in Edinburgh worked with sound, so Bell grew up around theories of speech and sound from the start. His grandfather, father, and uncle all worked in speech therapy for deaf people. Bell intended to follow in their footsteps. His family moved to Canada after his two brothers contracted tuberculosis and died. From there, they moved to Boston, still doing speech therapy. In fact, one of Bell’s students was Helen Keller, who could not yet speak at that time. While working with deaf people, Bell also worked with theories of sound in his free time. He was very curious and inventive, and came up with inventions that included a flying machine and a metal detector. One of the things the inventive Bell worked on was making improvements to the telegraph. Both telegraphs and telephones are electrical systems that work with wires, because the telephone came from Bell’s attempts to improve a telegraph. At that time, the telegraph had been in use for about 30 years. The system had become popular, but could only send or receive a single message at a time. Bell imagined a machine that could send more than one message using the same wire, at the same time. He wasn’t the first one to come up with this idea, but no one had yet successfully made it happen. He believed that it could become possible to send multiple notes at the same time, as long as they had different pitches. In late 1874, Bell told his father-in-law, a well-off attorney, about his idea for a “multiple telegraph.” The father-in-law had noticed the monopoly that the Western Union Telegraph Company held, and invested in Bell’s idea, hoping that it would break the monopoly. Bell used the money to work on the multiple telegraph, but he was also working with an electrician named Thomas Watson to find out how to send speech electronically. By the next year, Bell had nearly reached his goal of being able to transmit speech using electricity. He and Watson had discovered that different tones in speech could change the strength of an electric current flowing through a wire. The pair found that sound could successfully be sent through a wire by accident while working on a harmonic telegraph. They kept working into 1876, when at last Bell shouted a message to Watson through the mouthpiece of his invention and Watson successfully heard him. Bell got his patent for the telephone in 1876 and watched his invention grow in popularity. In 1877, the first telephone line was finished. At the end of 1880, the U.S. had almost 50,000 telephones. Telephone lines slowly connected different cities. In 1915, a transcontinental telephone service began. Bell had founded his own telephone company quickly, in 1877. The Bell Telephone Company bought its competition as the telephone grew in popularity. Since Bell own the patents and intellectual property of the telephone, it was easy for him to gain a near monopoly over the industry. This powerful control didn’t end until 1984, thanks to government intervention. After Bell’s invention had caught on, the next stage in telephone history was all about making improvements to the early telephone. In 1889, someone invented a switch that could connect a single telephone line to one of a hundred others, using a system of sliders and relays. This was a major improvement and allowed for more connections to be made faster. Before that, a telephone subscriber had to connect his own line to another line. Changes were also made to the system of dialing. At first, people had to tap a button the correct number of times to get the right number. However, the process became much faster after someone invented a rotary dial. T he history of the telephone wouldn’t be complete without mentioning the pay phones that were ubiquitous for decades. The first coin-operated phone was patented in 1889. This first pay phone, installed in a bank, required users to pay after they’d made their call rather than before. Payphones grew in numbers as the telephone grew in popularity. In 1905, early phone booths were installed. Pay phones were a major way to communicate from then until cell phones came about. Cordless phones weren’t put on the market until the 1970s. However, improvements to the cordless technology caused them to reach peak popularity in the ’80s and ’90s. Digital cordless phones added more security by spreading the conversation digitally, so it was harder to eavesdrop on. From 911 services to the invention of the smartphone, you can trace many things we take for granted today back to Alexander Graham Bell. Phones have become a daily part of life, and the evolution of the telephone hasn’t stopped. One of the most important telephone-related inventions for businesses has been live answering services. Check out our guide to the top answering service companies here.